For the best selection of optics to fit your mission, shop Palmetto State Armory! Will this fit a P320 full size pistol? It only has a lower rail, not upper. BEST ANSWER: You're kidding, right? Thought there was an adaptor to creat a rail for mounting. New at this, always learning. I saw one on a CZ85 SP01 at a gun show in Florida that attaches to the existing rail and has a brace that extends up along the left side (opposite the ejection port) and has a rail on top. It was made from anodized aluminum and was offered in several colors. Fit's mine, but shooting the gun upside down took some getting used to. You should find a different hobby. Perhaps you should be the one to find a different--and more respectful--way of answering a legitimate question from someone within this hobby. Not a problem mate, you just gotta turn it around to use it. You need to find a reflex sight like the Romeo1. Vortex, Leupold, and Burris all make them as well so you have options. There is Actually a mount that would work for that . It is HUGE and it would look INSANE. it basically mounts to the flashlight rail and puts a piece of picatinny on top.And then you would have a rifle optic on a h handgun.... which would also look INSANE. But.... i say GO FOR IT. I want to mount one on a Mossberg 590A1. is there a low mount option for this purpose? I don't want it the regular height. I need it down low on the receiver. what mount options are there? Yes, the unit comes with both low and high mounts. Yes, it should be low enough! If it isn't low enough you can always weld it on. Duh! Winning!! Does it come with any lens caps? BEST ANSWER: Yes it does. Inside the box comes a “Bikini style lens cover, Torx installation tool, lens cloth, CR2032 battery, Romeo 5, a low profile mount and an absolute co-witness riser”. I hope this helps with any other questions. Yes, the Romeo5 comes with lens caps. Yes. They are made of a rubber like material with two bands connecting them. The front and rear cap are different as the front of the sight has angles on the side of the scope body. Yes. It comes with rubber covers, lenses cleaner. Low rise mount, and tool to tighten to rail. It comes with a rubber-band style lens cap covering both ends. They do not flip up. Yes, it comes with the bikini cover that slips over front and rear. Yes, and a battery. Very good sightb I have couple of them. Yes it does. it's a rubber material. not plastic though. Yes it comes with bikini style, one piece lens covers. Yes, front and back connected rubber lense cover. Comes with a rubber bikini style lens cover. Yes, it comes with removable rubber caps. Does this, When mounted, also allow you to use your rear iron sights w/o Moving Red Dot out of the way. ...?! BEST ANSWER: Yes, it comes with two different mounts and you can have co-witness with your regular sights without removing the Red Dot. Which is great just Incase your battery goes dead. Yes it does. It is a bit busy with both Iron sights in the picture using the tall mount provided. I prefer using the front sight with the red dot. It Co-witness with my Troy Irons straight out the box. Do I need a riser with the Romeo 5 with a Ruger Carbine 9mm? BEST ANSWER: I have the 5 on my 590a1SPX and I use the low mount that is included in the box. Perfect fit and very low profile. It comes with a low mount also that works perfectly on the Ruger 10/22. No, read my write up somewhere below. It starts with " I Waited"
will this fit a 2003 crown vic police interceptor with a vw beetle rear ? BEST ANSWER: It will only fit American Muscle cars, primarily 2015 "50th Anniversary" GT Mustangs with the premium interior option. If it has a picatinny rail, yes. It will if you mount a rail to it. Hi: Will this red dot mount onto my P229? BEST ANSWER: Yes, simply use Jimi Hendrix style and works fine. I ordered the sig romeo 5,,the low mount was not in the box.the box was sealed.?? BEST ANSWER: Ditto - just a lens cleaning cloth and no low mount. How long until PSA and Sig figure out they have a problem. If they can't expedite it to me, it's going back. Doesn't say much for their QC. Did you get a resolution from PSA on this problem? Yes, contacted Sig - they aren't sure how it happened, but said they'll ship the missing mount when available. You'll need to take the attached high mount off the sight and give them the serial # off the bottom of the optic. Call Sig, they’ll get you one on the way. Same here on mine (arrived today). If they don't answer my email, I'm contacting my bank to dispute the charge on my credit card. The description on this very web site for this product CLEARLY states "-Includes a M1913 Picatinny low mount riser and a co-witness 1.41” riser mount", yet it's missing the mount. This is a problem! Quick Update: I got mine earlier today and all was fine. It came with both mounts (co-witness and lower mount), cleaning cloth, battery and adjustment tool. Worked perfectly. Received mine today, it came the same way. It had a cleaning clothes where the low mount goes and no low mount! The option of having a high & low mount was the deciding factor between the Sig or PA.
Just received mine today in the same condition, a cleaning clothes and now lower mount! I called Sig. He said that only PSA orders didn’t have them in the box and they were investigating why they were missing. He said they where backordered about two weeks. He took my info and is shipping one to me. Call Sig’s customer service. It didn’t take long and they’ll ship you the lower mount in a couple weeks or less. Call Sig, they’ll ship to you one. Will the romeo5 mount on an ar with the carry handle? BEST ANSWER: You would need to purchase a rail that uses a single thumb screw that mounts on top of your carry handle. Then you can mount any scope or red dot type sight to the rail on top of your carry handle. Some carry handles can be removed so if yours is the removable type the red dot will mount right in place of the carry handle. I had one of the cantilever mounts on an AR15 that I sold. 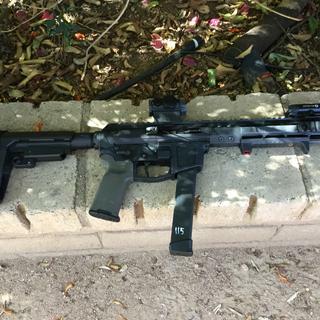 I had an EOTech mounted on it, and set it up so the red dot sat on top of the front sight. 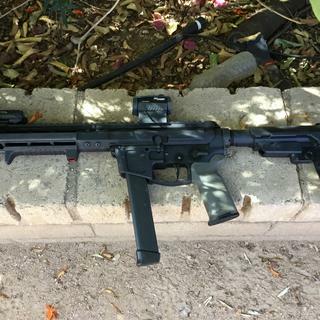 With that arrangement I could ignore the rear sight, but if the red dot failed, moving my eye a half inch or so lined it up with the rear sight. Some of the cantilever mounts are not adjustable, so you might not get a perfect co-witness, but probably close enough. Is it night vision as well? BEST ANSWER: It is compatible with night vision if you have it, that's what the first two settings are for. You have to have night vision Togo behind the scope. It is compatible with night vision on the first two settings, the next 8 settings will be brightness of the red dot. Can you mount this on a weaver style base on a Thompson Compass bolt action? Will this sight need to be zeroed again after each battery replacement? BEST ANSWER: Hi Jeff I have owned this sight for awile and have not needed to replace the battery yet but have taken it out. This does not need to be "zeroed" after a battery change. I would just to make sure its still zeroed,but the battery lasts along time. What ever you are comfortable with. What foot print does it share for aftermarket mounts ? BEST ANSWER: It shares the same footprint as Aimpoint T1/H1 optics. Plenty of aftermarket choices. This red dot fits easily onto Picitanny rails or the equivalent. It is easily movable and has a small footprint. Not totally clear on your question but I usually use the M lock mount with this reflex sight. You can also use key mod but need the adapter plate to provide the M lock slide mount. The m lock is less likely to have movement so zero is easier to maintain. Hi: Will it mount onto my P229? No it will not. You want to find a reflex site like the Romeo1 or similar. Will it fit a Ruger 22 bull barrel? BEST ANSWER: If you've got the top bolt on rail you install the Red Dot with the included low mount and it will work perfectly. I've got one mounted on a Ruger MKlll. will this red dot be blocked by a perm mounted A-2 front sight ? BEST ANSWER: No, it shouldn’t be a problem. It will cowitness. The mounts are good quality, too. Similar to a Daniel defense aim point mount. The ones I bought are the CR2032 battery model. If you get the AAA model, it will also work. Look at the manual online. I can’t link to it. The front sight will be in your sight picture. The dot when sighted in will be at the tip of your front sight post. I run several AR’s with fixed front sights and red dots. I don’t have any issues with that. This optic is a direct co-witness sight. The dot should be in later me with the top of the front sight post when properly sighted in. No, the high riser mount sits perfectly above the front sight. 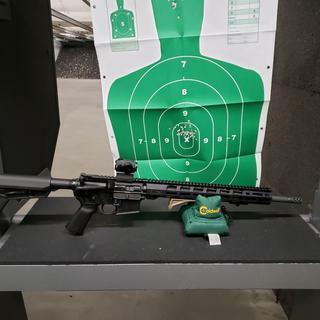 what type of range would you have with a ar15 223? It's an unmagnified optic so it depends on how good your eyes are and the level of precision you seek. Using a 50 yard sight in, 100, 200 and 300 yard hits on steel plates are consistent. Will it work on an Anderson arms ar15? Is the integral mounting system similar to a SPARC? Not the riser, but the mounts/screw holes in the body? BEST ANSWER: My Sig Romeo 5 did come with a battery. Yes, it comes with a battery, 2 bases. One for a flat profile and a lifted profile, and a tool for the screws. It's a pretty good optic for the price. Yes it comes with a battery, really nice quick ship. Super bright unit great for pop up drills and close building clears. Not in Cook County Illinois. Palmetto treats us like red headed step children! Yes. It comes equipped with everything you will need to mount and use. 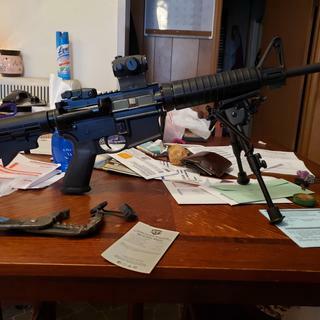 Will this mount on the Palmetto State Freedom AR-15 rifle with the front iron sight on it without affecting the line of sight? BEST ANSWER: Yes, if your height is correct to "go witness", use the irons I do. I have one on my galil ace, and I utilize the open area under the sight for irons and the optic for quick acquisition. You cantose at this price. If you use a pop up rear sight, the red dot and your iron sights will cowitness. If you are not using a rear sight the front sight will not be in your way, the dot should be just over it . Should co-witness. The sight comes with mounting options. You will be looking though the sight and your front sight will line up with the romeo dot after sight in. The mount provided will give you an absolute co-witness. So your red dot should sit right at the top of your front sight post. The dot will co-witness with the top of the front post. It will fit without affecting the front sight. Yes, with the high mount. How far can the red dot reach accurately for an ar15? BEST ANSWER: That’s a tough question as it varies in barrel length, size of target etc. I can thump coyotes out to 200 without magnifiers in my 16” carbine. I can keep it on the head of a silhouette target at 100 with my 10.5”. Unless you have a magnifier, it is accurate only as far as you can see clearly. Hundred yards is no problem. If you have good eyes even farther. I shoot 300 yards without any problem. Is this AR compatible ? BEST ANSWER: This will fit any milspec 1913 picatinny rail. In short, yes it will fit your AR. 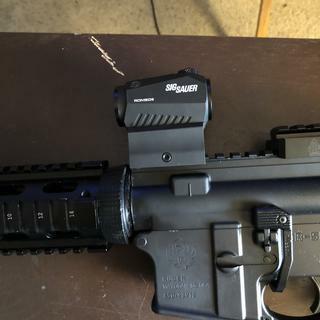 This is also an awesome budget optic for the money and you will not be disappointed. Yes it will so long as you have s Picatinny rail and depending on the riser height you choose to can co-witness with iron sights . Yes! It is very much AR platform compatible. Will it work on kel-tec sub 2000? BEST ANSWER: Should be fine, may even be able to do-witness with your iron sights. I would say no. It doesn’t co witness and you can’t fold it. I took it off my A.R. pistol and put it on my sub 2000 just to be sure . It fits on any standard picatinny rail. If it has picatinny rails it will. 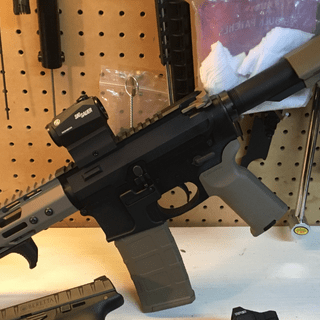 Will the Sig Romeo5 fit the Smith and Wesson MP AR15? BEST ANSWER: It fits any standard 1913 Picatinny rail, so yes it should be fine. BEST ANSWER: Not to my knowledge. Just another good deal from PSA! Purchase, zero, shoot, repeat. Enjoy. With this scope work with (or co-witness with) the Magpul MBUS flip up sights? BEST ANSWER: Yes it will. On my 'Banshee' 9mm pistol, with the Romeo5 and included high mount, the Magpul sights co-witness in the center. It co-witness's with my troy buis using the high mount that it comes mounted on. It should co-witness with magpul as well. Yes. It will absolute co-witness with MBUS sights. will this sight also mount on weaver base ? BEST ANSWER: I see no reason it will not. It’s the same design as most rails that mount any number of sights. Not likely. Picatinny uses a cross bolt that Weaver typically does not have slots to accept. I DON'T THINK YOU CAN MOUNT THIS UNIT ON A WEAVER BASE. Should have asked an easier way. Will the romeo5 go on the AR-15 Freedom rifle without having to remove the front triangular iron sight. Will the romeo5 sit up high enough on the Freedom rifle top rail/MOE system? BEST ANSWER: Yup, the tall mount sits pretty high. Even clears the entire front sight hood on my Mp5. Yes it will work. But depending on what you idea of “high enough” is it might not be what you have in mind. There are mounts that will raise the optic up higher if you desire, that can be purchased separately. It will with the taller cowitness mount it comes with. That’s what it’s for. will this fit on a P365? BEST ANSWER: The Sig Romeo 5 is intended for rifle use. It wouldn’t fit on the P365. If you were to find a way to mount it; it would be impractical. Hope this helps answer your question. If you are going to install a red dot sight on a p365, provided you did the milking for the slide I would use a Romeo 1. The Romeo 5 is way to bulky and heavy. No. Too big. Works great on ARs etc. Equal to or better than optics three time its price. Two thumbs up. I have used a number of different Red Dot optics over the years. This sight is equal to or better than optics three times its price. It is accurate and so far holding a zero very well. I am happy with the purchase. I am happy with it so far. 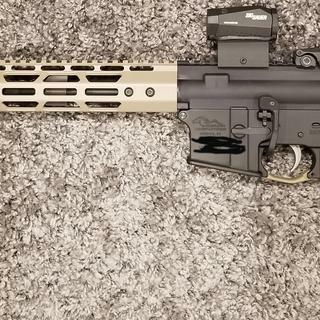 Definitely a budget optic, but at least it isnt embarrassing to have on your rifle like a 30 dollar red dot. The best red dot for the money that you can buy period. I haven't taken it to the range yet, but so far I'm very happy with this. Nice bright red dot, and a large sight picture. Price, weight and quality is great. Need a simple red dot. This will do the job. Like so many others, I am very impressed with this Red Dot Sight. Works perfect and does exactly as advertised. The motion activated light is a great feature. I would recommend this sight and will probably order another one for my next build. Great deal! Get one now! I would buy again. I have 3 of these. On an Ak47, Ar15, and keltec. Holds zero.after going to the range and about 100 rounds through each rifle. Have not yet tried a pistol though. I like the power saving settings and the res dot is visble on a sunny day at mid to high settings. I like mine, I ordered a number of them, I have them mounted on my Daughters M&P 15, my 10.5" .300Blkout and presently on my Ruger MK IV Hunter, but I may move that one to something else.. I bought 5 total. Such a great price on a quality red dot optic. Snap to install, clear and easy to identify, and love the variable brightness settings and that it shuts off after two minutes of inactivity to save battery life. Co-witnessed with my iron sights right out of the box. Highly recommend.....as good or better than others I've seen at twice the price. I shot this on a buddy's 9mm AR and it took me about 5 shots to fall in love with it. At that point, I had no idea of the cost, but immediately went in search. Incredible surprise when I found that not only is it a great sight, it's an incredible buy. I'm ordering more because I don't think it can be beat for the money and I have a couple more I want to put it on. The instant on/off feature is a major plus and it's as accurate as red dots I've used for four times the price. PSA's super fast shipping (and free!) was yet another very pleasant surprised. My recommendation - buy now! Great optic. I was looking at getting the 4T but couldn’t justify the price. Tried this and it was a match made in heaven. Like it so much I got another and I don’t see putting any other optic on my rifles than this. Saw the same one at a big outdoor store for over $100 more. For that price, at PSA you can get the optic and a healthy amount of ammo to sight it in and plink away. This is a great 20 mm red dot, the dot is very nice and stands out on target. I love the idea that shuts down when not in use and when you bring it on target it has turned on. I have a 3X magnifier behind the unit and it works great. Easy to use. The dot can co-wittness well with BUIS. Holds true even after LOTS of rounds. Love it. Wish it had flip up covers but is a nice addition great price. This red dot sight it's very much worth what is priced for. I like the motion activation. Great red dot. It is perfect size and weight. Definitely my favorite low cost red dot! Nice little red dot. Does what it’s supposed to do. This thing is sturdy, reliable, consistent, and smarter than me at preserving battery life. At this price, this is probably going to be the only red dot I buy from now on. Good features easy to use. Installed this on my Ruger MPR. Initial bore sighting got me on the paper and a succession of 3 round groups got me dialed in at 25yds for a 200 yd zero. I like the easy on and brightness retention features. Much better than a Bushnell red dot I have on another rifle. I have a second Romeo5 that I want to try on my Century Arms AK as soon as I can buy the proprietary optics side mount. Good red dot, but bad rail riser mount. I really like the actual red dot. It is great on my AR-9. But it pops off on ever AR I put it on due to the tiny rail clamp sig provedes with it. I even have red lock tight on the screw. It will not stay no matter what I do. I have to find a new better option. Very disappointed about it. I have multiple different red dots. Cheap and moderately expensive. Non of the others have this issue. Awesome red dot. Excellent price. I love the auto off and on feature. Great construction, love the auto on/off feature to save battery life. Solid red dot for the price! By far the best red dot I own!!! Absolutely love it! Exactly what I was hoping for. The motion activation is the main reason I got it. In a shtf situation I don't wanna be fumbling my fingers trying to turn it on. It zeroed in perfectly and holds zero when I take it off and put it back on. You would be an idiot not to buy this red dot! Especially the price. The housing is basically indestructible. The lens are crystal clear. And it's waterproof. Actually thinking about getting a couple more just because it'll make me buy another gun or two to put it on. Absolutely love it!!! I don’t really have a lot of things to say about the optic other than it’s really solid - the build quality is really clean- the optics themselves are superb and crisp- I’m really happy get this thing is as inexpensive as it is. Best dollar for dollar red dot out there. Great little red dot. Glass is great at the price point and features can’t be beat. Not even disappointed that the price dropped $10 a few weeks after I bought it. Shipping was fast. Mounted to my AR pistol and it performs and look great. Great optic for the money. Holds zero Well. Great little optic , works well. Awesome optic on my ar pistol!! Would buy again!! This red dot doesn't turn on when its moved like its supposed to do, you have to turn it on and off with the buttons. The turrets to adjust windage and elevation are very hard to turn and the plastic covers will not move them. I don't know if this was a refurbished item. BUY IT NOW BEFORE THEY RUN OUT!!! Strongly recommend to buy this sight. Did my research online and for the price and the quality you can’t bet it. Also the shipping was quick and Palmetto State Armory kept me posted everything that was going on with my package. Great sight! Works great and very accurate! Good red dot with great features for great price. Excellent electronic sight for the money. I own several different red dot sights, and I have to say that this is my new favorite. This includes some of my high end optics. Great product for a great price. Works great.i may still buy a scope for longer range. I was on the fence what way I wanted to take my AR I bought a cheap scope and couldn't get close to the target. returned it and saw this on sale. ordered it. then talked to my PD firearms instructor and he told me he loves them for an affordable optic. Love it, amazing price for the quality!!! Very fast delivery, price was right, & product was as advertised. Very good experience. PSA has the best price free shipping and customer service on this excellent Low cost red dot sight. Works excellent in bright days with snow on the ground and in nighttime conditions! Awesome optic for the price, MOTAC works great and works well on bright sunny days with snow on the ground. Was missing the low profile mount but contacted SIG and they had one shipped out in two weeks at no cost. Quick delivery, easy installation and works fine. Next, to the range for a test. So far so good. Excellent red dot specially for the price. Outstanding Red Dot for short money. Outstanding quality red dot, especially for the money . It's a lot of optic for an extremely reasonable price. Nice bright crisp and clear dot. I highly recommend this product for someone not looking to break the bank but wants to get the job done.